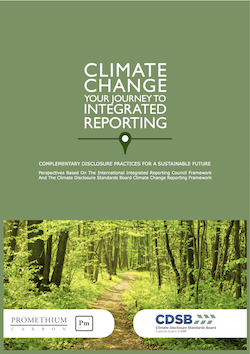 CDSB and Promethium Carbon have developed a guide for CEOs, CFOs, reporting committees and internal auditors on integrated and climate change-related reporting. This guide explores and compares the fundamental concepts, guiding principles and content elements set out in <IR> with the requirements of the CDSB Climate Change Reporting Framework, and illustrates the synergies and differences through examples. View the guide here. Integrated reporting and climate change-related reporting have much in common: both are relatively new, both require companies to think and act in new ways, and most importantly, both can help to shape a corporation’s competitive advantage over the next decade. Reporting places burdens on already strained corporate compliance functions, but recognising the synergies between the two types of reporting can minimize those burdens.